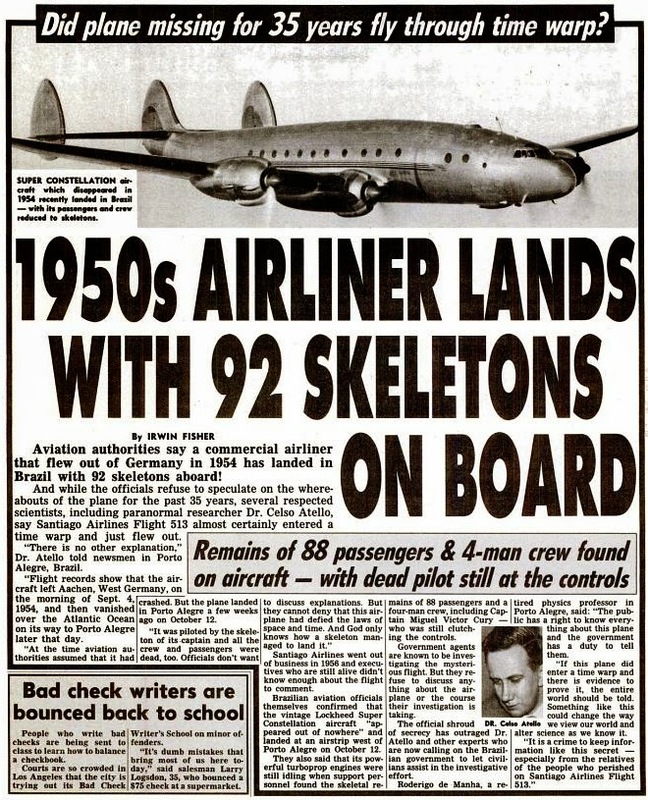 In 1989, according to aviation authorities report, a commercial airliner that flew out of Germany and mysteriously disappeared in 1954 has landed in Brazil - with its passengers and crew reduced to skeleton. And while the officials refuse to speculate on the whereabouts of the plane for the past 35 years, several respected scientists, including paranormal researcher named Dr. Celso Atello, say Santiago Airlines Flight 513 almost certainly entered a time warp and just disappeared in 1954. "There is no other explanation," Dr. Atello told newsmen in Porto ALegre, Brazil. Flight records show that the aircraft left Aachen, West Germany, on the morning of September 4, 1954, and then vanished over the Atlantic Ocean on its way to Porto Alegre later that day. At that time aviation authorities assumed that it had crashed. But the plane mysteriously reappear and landed in Porto Alegre on October 12, 1989. "It was piloted by the skeleton of its captain and all the crew, and passengers were dead, too. Officials don't want to discuss explanations. But they cannot deny that this airplane has defied the laws of space and time. And God only knows how a skeleton managed to land it." Unfortunately, Santiago Airlines went out of business in 1956 and executives who are still alive didn't know enough about the flight to comment. Brazilian aviation officials themselves confirmed that the vintage Lockheed Super Constellation aircraft "appeared out of nowhere" and landed at an airstrip west of Porto Alegre on October 12, 1989. They also said that its powerful turboprop engines were still idling when support personnel found the skeletal remains of 88 passengers and a four-man crew, including Captain Miguel Victor Cury - who was still clutching the controls. Government agents are known to be investigating the mysterious flight. But they refuse to discuss anything about the airplane or the course of their investigation. The official shroud of secrecy has outraged Dr. Atello and other experts who are now calling on the Brazilian government to let civilians assist in the investigative effort. Roderigo de Manha, a retired physics professor in Porto Alegre, said: "The public has a right to know everything about this plane and the government has a duty to tell them. "If this plane did enter a time warp and there is evidence to prove it, the entire world should be told. Something like this could change the way we view our world and alter science as we know it. "It is crime to keep information like this secret - especially from the relatives of the people who perished on Santiago Airlines Flight 513." Weekly World News - there's a reputable source! This sure sounds like an eisode of The Twilight Zone, a science fiction program from the 1950's to the 1970's(?). I've seen similarr themes, mainly one taking place in Germany during WWll in which a glider pilot was stabbed just before taking off and after the war the other members of the glider club were at the airfield when the glider returned and landed with the pilot's skeleton in the cockpit. I also remember and episode in which a jet liner went through a time warp and found themselves back in the dinosaur age, and then went back through the warp and tried too land at Idlewild in 1939, finally going through the warp a third time and being left still trying to return to their own time. Fun, but too far fetched for reality. Was Bat Boy piloting the plane? So who landed the plane? Skeletor? Still that's the most beautiful airliner that was ever made! Wish I had one of them. Not a comment but a question ??? Where is this plane now and the burial sites of these passengers and crew. No 1950s lost aircraft has ever landed in Brazil , Dr. Atello is a fictional character and fortunately Weekly "Weird" World News (a american fictional news tabloid) closed its doors on 2007. Where are the pictures? lol.